Themed around our old west town of “Chimney Rock,” Ten Bits Ranch provides Big Bend National Park lodging for up to 18 guests. We designed each guest room to be part of our old west town so your vacation may include a stay in the Bank (two queen beds), Gun Shop (one queen bed), School House (one queen bed), or General Store (two double beds, handicapped accessible). All four guest rooms have plenty of space, a private bath, spacious covered porch, air conditioning, flat screen TVs with Dish Network service and a gas log fireplace. Plus Wifi is available in each guest room and in the Cantina. Guests have access to United States phone calling in the Cantina and Verizon cell coverage on the Ranch. Please bring a calling card for long-distance calling needs. Ten Bits Ranch offers a self-serve continental breakfast daily in our Cantina. The fare consists of cereal, juice, coffee and waffles. If you would like to enjoy the local dining in Study Butte, the Chili Pepper Café and the Diner at the Alon Station offer a wide range of breakfast dishes. 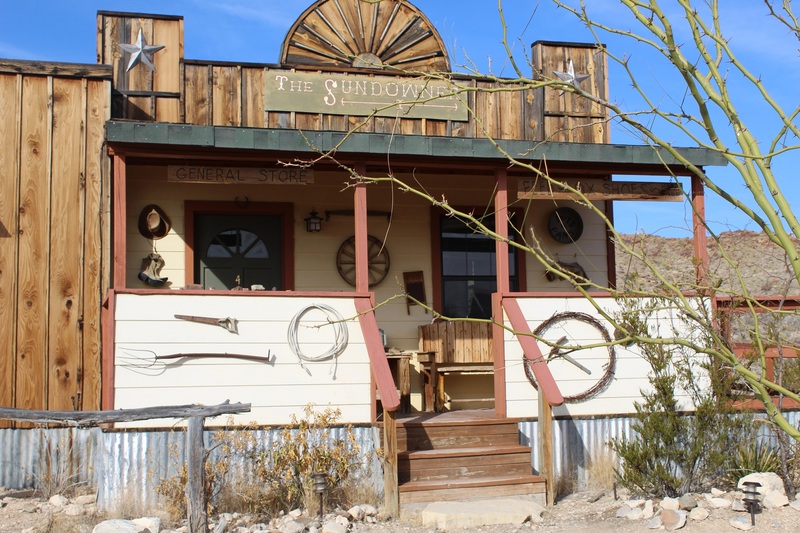 Restaurants in the Terlingua and Study Butte area are shown in this PDF download. Ten Bits Ranch offers a beautiful, secluded, off-the-grid Big Bend National Park lodging in the Chihuahuan desert region of Texas. We can accommodate up to 18 guests.We offer a minimum of two night stays. Reserve your room early for major holidays, the chili cook-off (the first weekend in November) and the two weeks of Spring Break (March). To make reservations, email us or call 432-371-3110. If we don’t answer right away, please leave your name, phone number, dates requested and number of people in your reservation. We’ll return your call as soon as possible. 1/2 the package price is due at the time of booking by credit card account (Master Card, VISA or Discover). The balance of the payment is due 7 days prior to your visit. Please see our Cancellation Policy. All rooms are non-smoking indoors. Smoking is permitted outdoors and on the large porches at the Ten Bits Ranch. Ten Bits Ranch provides a 50% total cost refund (less $50 service fee and credit card fee) with notice of at least 7 days prior to date of stay. Within 7 days of your scheduled arrival, no refund will be issued.